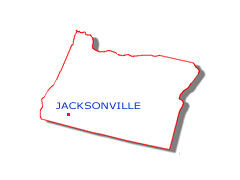 Jacksonville is just a few minutes drive through lush orchard country from Medford and Ashland. The town sprang up during the gold fever of 1851 and today there are over 80 historic buildings from the gold rush days, many of which have been preserved or restored to their original state. In 1966, the entire town of Jacksonville was designated a National Historic Landmark by the U.S. Department of the Interior. Peter Britt briefly joined the rush for gold in 1852 but turned to his passion for photography to capture forever the architecture, people and everyday life of early Jacksonville. His legacy lives on in the Peter Britt Music Festival. This is the oldest outdoor performing arts theatre in the Northwest. Britt presents a broad range of world class musical performances throughout the summer at the open air Britt Pavilion. The pavilion is situated in a natural hillside amphitheater overlooked by ponderosa pines and madrones. Jacksonville's annual Victorian Christmas celebration is very popular. There are horse-drawn carriage rides complete with Santa Claus visiting the holiday shoppers. Jacksonville has a great selection of restaurants, lodging and shopping. There are numerous trails around the town that take you past the old gold mining sites. On the third thursday of every month is Jacksonville's 'Art Amble'. Here, between 5pm and 8pm, you can sample fine wines and snacks as you take in the art at most of Jacksonville's art galleries.